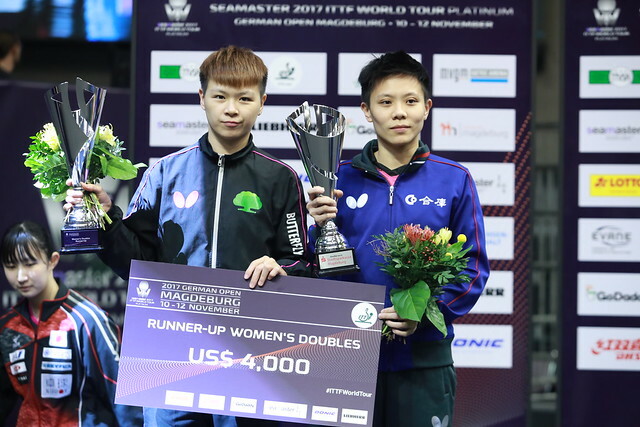 Top seed Fan Zhendong has crashed out of the Seamaster 2017 ITTF World Tour Platinum German Open on Sunday 12th November after suffering a seven games defeat at the hands of the host nation's Dimitrij Ovtcharov in the last four of the Men's Singles tournament in Magdeburg (11-13, 7-11, 11-7 11-3, 9-11, 11-8, 13-15). Germany’s Dimitrij Ovtcharov made a fantastic start to the semi-finals tie, picking up victories in the opening two games to sail into a strong lead. However, Fan Zhendong managed to draw the scores level at two games apiece with back-to-back success in the third and fourth ends to halt the home player’s momentum. Much to the delight of the home crowd the third seed Dimitrij Ovtcharov regained his advantage once again with a positive showing in game five, but Fan Zhendong wasn’t going down without a fight and successfully recovered to force a deciding game. Dimitrij Ovtcharov then held a 10-8 lead in the final end, requiring just a point to seal the win, however, the match was extended further with two consecutive points going to Fan Zhendong to take the game to deuce. With the scores tied at 11 points apiece multiple match point opportunities followed for Fan Zhendong, but a determined performance saw Dimitrij Ovtcharov take full advantage of the home support to come back and claim a sensational 15-13 victory to move through to the gold medal match. “I’m extremely excited to win my first match against Fan Zhendong. The first time I met him in the Chinese Super League, I was up 2-0, and last time we played at the World Tour Grand Finals last year I was 2-0 up as well, and today as well, he always comes back strong. In the third and fourth games, I had no chance, but I tried my best, I basically took all the chances I got… I’m very pleased”, Dimitrij Ovtcharov. The other finalist is also a German representative with Timo Boll emerging victorious over Korea Republic’s Lee Sangsu in the other semi-finas encounter. Timo Boll, who is aiming to secure a fifth Men’s Singles trophy at the German Open, put in a controlled display throughout the match, seeing off the 14th seed in straight games (11-4, 11-9, 11-4, 11-9). “He couldn’t feel my game so well, my rhythm, my serves. He was thinking maybe too much and I confused him a little bit with my tactics and variations. It was tactically an unbelievably good game”, Timo Boll.